© Betty Crocker Recipes on Flickr. 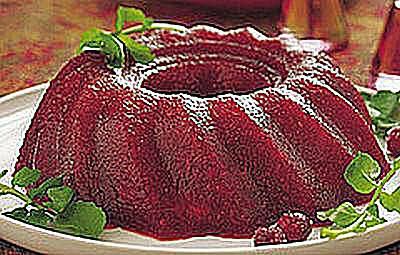 Port wine-cranberry gelatin molds exist in various iterations. The fact that the wine is uncooked, makes this off limits for kids. Don't use fresh or frozen pineapple in this recipe. See the information below the directions to this recipe, below. DO NOT follow the directions on the box of Jell-O; instead, add 1 (6-ounce) package black cherry Jell-O or cherry-flavored Jell-O mixture to 1 cup of water and boil in a large saucepan. Add 1 (20-ounce) can drained crushed pineapple (do not use fresh or frozen pineapple), 1 (14-ounce) can whole-berry cranberry sauce, 1 cup port wine and 1 cup chopped walnuts or pecans, and mix thoroughly. Pour into a ring mold and refrigerate until ready to serve. Line a platter with lettuce leaves and unmold the gelatin on it. Place a pretty glass filled with Hellman's mayonnaise in the center hole.